The Etna volcano is one of the most coveted destinations for technical hikers. Our excursion to the summit craters is the top of trekking Etna, in Sicily. The beauty of this spectacular painting created by the forces of nature leaves hikers completely without breath. This memory will never be erased. Throughout the day a guide will describe in English the places visited. The emotion once arrived at the top is strong, unforgettable. We will take the cable car from a height of 1920m to reach 2500m altitude. Here we will drive up by 4×4 unimog’s to 2920 m. The first stop will be made at the hot crater of 2002, which overlooks the big and old caldera “Valle del Bove”. Our Trekking to the craters of the summit starts here, reaching about 3350 meters. You will find yourself in a lunar landscape on the highest point of Sicily. In addition, we will make a descent on the craters of pyroclastic sand. We will pass by the famous crater of 2001 and from here begins our descent by cable car to the altitude of 1920m and equipped with helmets and flashlights you will enjoy an unforgettable experience visiting a real lava cave. Conditions of the offer: The Tour is available from May to September. It is a group tour that will be offered only with a minimum of 5 participants. Type of trekking Etna: ring (the same starting and ending point). Stages: Sapienza Refuge – craters 2002 – view Valle del Bove – summit craters – crater 2001 – back. Elevation: approximately + 500m, -1000m, over 12km. Travel time: approximately 7 hours, 09h00 – 16h00. Altitude: 1920m> 2500m by cable car, 2500m> 2920m by 4 × 4 bus and trek to Etna summit. Recommended equipment: UV3 sunglasses, hiking shoes, gloves, hat, sunscreen, 3-layer clothing (for different temperatures during the tour), water and food. The excursion to the summit crater zone is dangerous, forbidden to those with heart diseases and asthma. The itineraries are subject to change depending on weather conditions and the geodynamic activity of the volcano, in addition to possible eruptive activity, the risk is represented by cold, thunderstorms, lightning and fog. Pickup service: In the area around of Taormina and Catania pick up and drop-off at your hotel, camping, pension, holiday house, railway station, port, etc. is included. 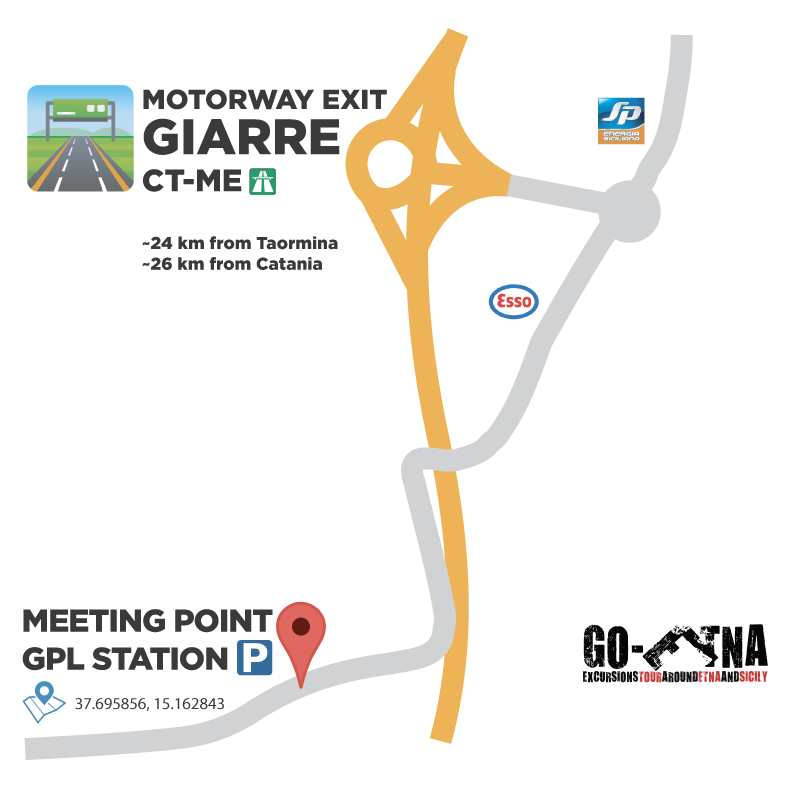 Possibility to meet us at the highway exit (in case you travel with your own car). 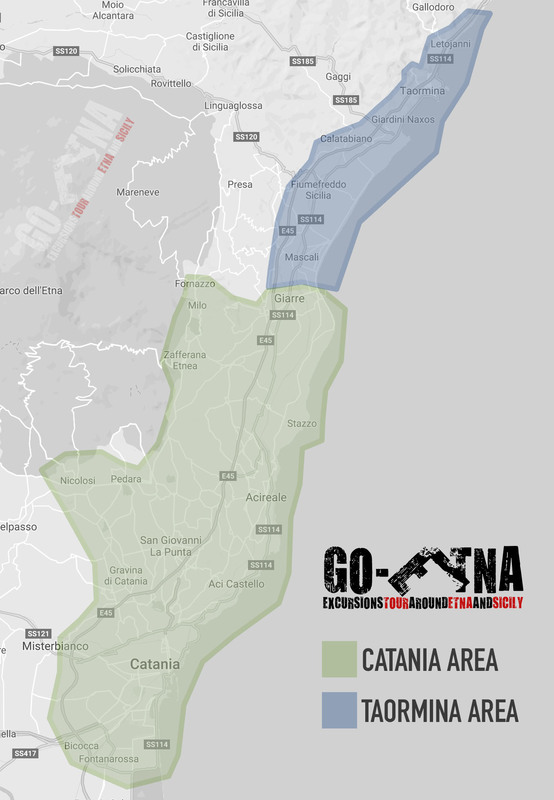 On request, with a supplement, it is possible to request pick-up service also outside of Catania / Taormina, for example: Syracuse, Noto, Messina, etc.